Self-Aligning Screw Assortment Gold & Stainless Screws For Eyeglass Spring Hinges 1.2mm, 1 | QTE North America, Inc.
Self-Aligning Spring Hinge Screws with special snap-off points for easy insertion. Simply screw into the hinge and snap-off the pointy end, quick and easy! 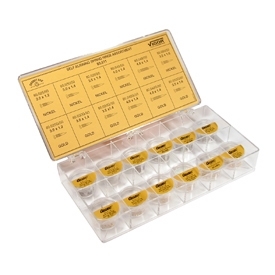 These tiny screws are packed in vials, then packed in a 12 compartment rectangular box. Everything is marked for easy identification and reordering.